There are other issues in the case, but ultimately the ban will rise or fall based on whether the court believes that the ban is anything other than anti-Muslim animus. On Wednesday, the Trump travel ban returns to the Supreme Court again. This time, the case is called Trump v. Hawaii, and it is about the third version of the ban that was issued in September 2017, after previous versions were suspended, limited, partially allowed, and put on life support by the Supreme Court and lower courts. Unlike previous cases, this one about the substance of the ban, not an injunction limiting its application. And the ban itself is intended to be semi-permanent, unlike the 90-day versions from past cases. There are two major issues in the case, one based on immigration law and the other based on the Constitution. Both are highly ironic. The first major issue in the case is whether the ban exceeds Trump’s executive power. Unsurprisingly, the same conservatives who decried President Obama’s “imperial presidency” are now defending Trump’s imperial order. Then, creating a priority list for deportations (DACA) was said to be a vast excess of presidential power. Now, completely throwing out the statutory system for visas is said to be within presidential power. Hawaii says that while the president can block a limited “class of aliens” from coming to the United States, 150 million people from eight countries do not constitute such a class. They also argue that the plan violates immigration law, which prohibits discrimination on the basis of nationality. The government, once again, says that the president can basically do whatever he wants when it comes to immigration and national security. The second major issue is whether the ban violates the Establishment Clause by disfavoring one religion, Islam, over others. Here, once again, Hawaii and liberal groups point to Trump’s numerous statements before he was president proposing a ban on Muslims from entering the United States, which is blatantly unconstitutional, as well as the history of the order’s revisions as a transparently obvious effort to slide the ban through on facially neutral grounds. The Trump administration has admitted that a “Muslim ban” does not pass constitutional muster. So, they instead counter that this isn’t one. 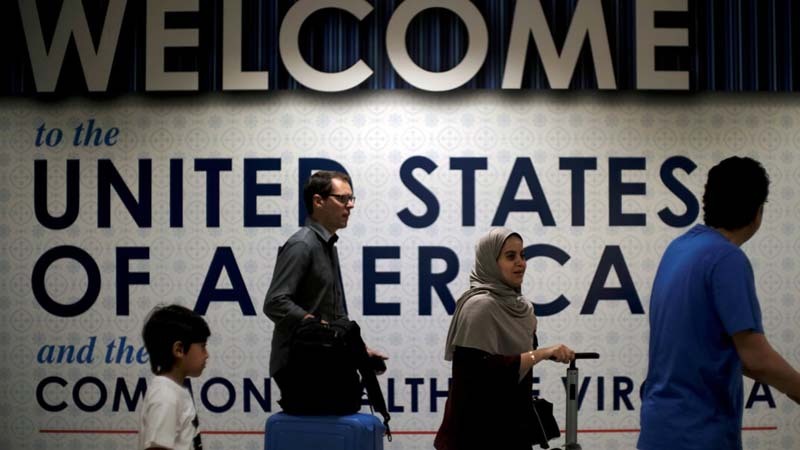 They note that the September ban also prohibits Venezuelans and North Koreans from entering the U.S.; that there was an inter-agency review of security threats; that these are particularly war-torn and terrorism-prone countries; and that there are many large Muslim countries that are not included (e.g. Malaysia, Saudi Arabia). All this, they say, proves that the ban is based on national security, not religion. Never mind what Trump said during the election. So, hypocrisies notwithstanding, how is the Court likely to rule? Of course, with a case as contentious as this one, it’s difficult to predict—but don’t look for the Court to split on partisan lines. The four more liberal justices will almost surely reject the ban as an unconstitutional display of religious animus. But when it comes to the five conservatives, cases like these are tricky. First, it’s unlikely that the Court’s judicial conservatives—Roberts and Gorsuch in particular—will be enamored of granting the executive branch so much power. For his part, Justice Gorsuch has expressed skepticism of deferring to administrative agencies, a bedrock of administrative law. Of course, the president is due deference in evaluating matters of national security—but is deference the same as a blank check? There is really no precedent for the travel ban. President Carter suspended visitors from Iran, and President Reagan those from Cuba, but those were far more limited, and tied to specific state actions on the parts of both countries. This would be an unprecedented expansion of the power of the executive branch. Roberts in particular seems acutely aware of the Supreme Court’s status and legitimacy at this moment in history. In that regard, the travel ban case looks a lot like Korematsu v. U.S., in which the Supreme Court allowed the executive branch to put 120,000 Japanese Americans in internment camps from 1942-45—and that was on the basis of a far more articulate national security rationale than the travel ban. Korematsu is widely regarded as a low point in the Court’s history, a time when the Supreme Court failed in its role to protect the individual rights of a vulnerable minority. Trump v. Hawaii could well be seen similarly, something Chief Justice Roberts and Justice Kennedy are surely concerned about. To be sure, a travel ban on non-citizens is very different from the internment of citizens. But the administration’s post hoc rationalizations for the ban are so flimsy, and its addition of Venezuela and North Korea so transparently clear, everyone knows that it’s really a ban on Muslims, fulfilling a campaign promise that had more to do with populist xenophobia than with a dispassionate assessment of national security threats. Beyond the more technical claims—in addition to the question of executive power, there are thorny legal questions regarding whether the Court ought to hear this case at all, and whether it can strike down the ban everywhere given that only Hawaii is a party to this case—the case will really rise or fall based on how seriously the Court takes the Trump administration’s rationales. Unlike the earlier bans, a team of government lawyers has done its best to put lipstick on the pig. If you stick to the reasons they set forth, then the travel ban isn’t unconstitutional. But if you just play this twenty-second video, in which the now-president said “Donald J. Trump is calling for a total and complete shutdown of Muslims entering the United States,” it’s pretty clear that what’s beneath the lipstick is bigotry.